If you’re one of those busy business owners who hasn’t found the time to get to grips with Google Analytics, then I’m here to offer you some quick tips that will help get you started. 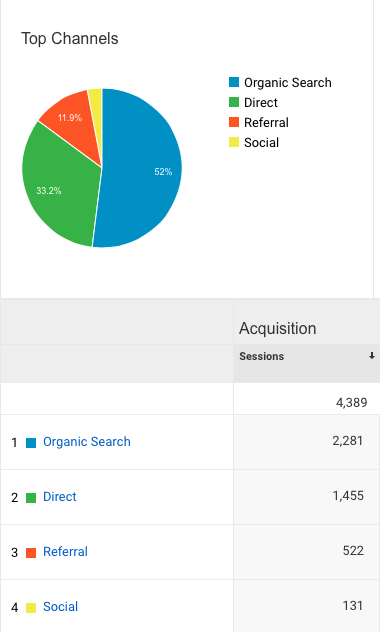 Google Analytics is an incredibly useful business tool, but like anything new, it can seem quite daunting. The good news is, there are some really useful reports that are easy to access very quickly. The even better news is, once you’ve got to grips with the navigation, you’ll discover a wealth of information that you can use to develop your business and your website. It’s definitely worth dedicating some time to mastering the basics and learning how to save your favourite reports, so that they’re easily accessible next time you log in. For the purposes of this blog I’m going to assume you’ve got Google Analytics set up and that you can log into it. I’m not going to go into detail about how to install it, as installation varies according to the platform, themes and plugins you use. You should be able to find instructions on how to install Google Analytics by doing a web search for your platform + how to install Google Analytics. If you click on any of the navigation options, a drop down list of the standard reports in that section will appear. Click again to hide the list. Audience – Here you’ll find reports relating to your website’s visitors, such as their age, interests, gender, location etc. Acquisition – These reports provide detail about where your visitors came from i.e. what drove them to your site. Behavior –These reports will tell you how your website is performing i.e. which pages people are landing on and which are most frequently exited, as well as how fast your site loads. You’ll discover a wealth of useful information simply by clicking on Audience, and then Overview. To select the date range that you want to see reported on, go to the calendar in the top right hand corner of your screen. Click on the down arrow to bring up the calendar, select the dates you want and then click apply. The graph at the top of the page shows you the peaks and troughs in your website traffic. If you see a peak and can identify what caused it, for example, you sent a newsletter out on that day, then you can leave yourself a reminder for future reference. To do this click on the appropriate point in the graph, so that a circle appears on the peak. Then click on the small grey arrow under the graph. A link for ‘Create new annotation’ appears to the right. Click on it and fill in the box with a description of the event. Then click Save. The information underneath the graph is the really useful stuff. It tells you how many people have visited your site in your selected time period, on average how many pages they visited and how long they stayed on the site etc. To discover what each figure relates to, hover over each word e.g. Sessions, Users, Pageviews etc. and a pop-up box will explain what they refer to. If you discover a report that you know you’ll want to look at again, click Save in the top right hand corner. Next time you log in, click on Customization in the left hand navigation and go to Saved Reports. You’ll find all your saved reports there. To discover what countries your visitors are from, in the Audience Overview page scroll down to Demographics and then click on Country. A list of countries and the number of visits from that country will appear. You’ll see the top ten countries by number of visits. To see the full list, click on View Full Report in the bottom right hand corner. You can also click on each country for a more detailed break down of visitors by region. It’s really useful to know what sources have sent visitors to your website. For example, whether they came via another website, a google search, or from a social media link. To discover this, in the left hand navigation click on Acquisition and then Overview. You’ll see a graph and a table telling you how your visitors came to your site. Direct – These are visitors that came to your site by directly by typing in your URL or clicking on your site in their bookmarks. Referral – These are visitors that have clicked on a link to your website, from another site. Social – These are visitors that have come from a social media source such as Twitter or Linked In. It’s definitely worth spending some time delving into the reports in the Behavior section. If you click on Site Content you’ll see the number of visitors each page received. Don’t forget you to adjust the calendar to view specific time periods. 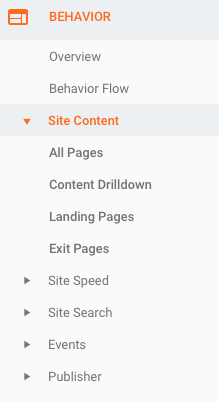 Click on Landing Pages in the drop down menu to see which pages people are landing on, and click on Exit Pages to see which pages people are leaving your site on. If pages are underperforming then you might want to consider different keywords and ways to optimise them. My main tip is to just keep clicking and digging for more information. You can’t break it and you can always click the back or home button if you get a bit lost. The more time you spend on it, the more sense it will all make and the more insight you’ll gain. Once you get to grips with it, you’ll wonder how you ever lived without it. You’ll use the information to influence your social media campaigns and marketing and to help improve your website’s performance. It’s very addictive!